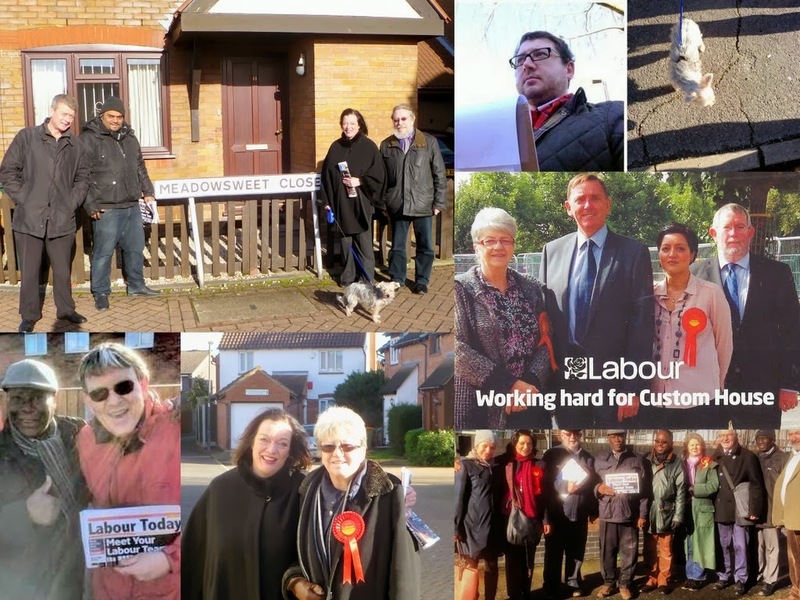 Some pictures from the West Ham Labour Party "Super Saturday" doorstep at Custom House. Organised by our MP Lyn Brown (and supported of course by Cara, the Labour attack dog - see top left and right photo). I believe we had 19 activists turn up in total. We started off in my team at "Meadowsweet Close". A very rural name. Local Councillor Pat Holland (see picture with Lyn) remembers as a child going Blackberry picking in this area (NB nothing to do with smartphones). There is a large East European community in the area. I met a resident who was Hungarian, who was impressed that I had a Uncle who was also Hungarian, who came over as a refugee following the revolution in 1956. I remember him teaching me how to play very serious chess as a boy. It made me also remember that East Europeans in the UK is nothing new. A close trade union friend and colleague (very sadly no longer with us) was the son of a Free Polish Army fighter as was my former manager's husband. While of course in the recent past, East London use to have one of the largest East European Jewish communities in the world. It made me think "There is nothing new in the world except the history you do not know"